I traveled on a plane Saturday morning and headed to the Sunshine State (FL) for a family reunion. Though I've made this trip hundreds of times already since I was eight years old (back then a child could safely travel solo), I saw cotton ball clouds, white sandy beaches, and green water. The Atlantic had me comparing it to the algae-filled Lake Erie. I lived next to the one of the largest fresh water assets of the Great Lakes. I've seen needles wash up on shore, zebra mussels claim their territory and recently heard about an infamous dumper of cooking oil in the open water. Yet one of our greatest assets might be that wonderful, green algae. Research is continuously underway to figure out exactly how to milk algae. That's right, NPR (Science Friday) covered a great story of how to milk algae like a factory for energy/oil. 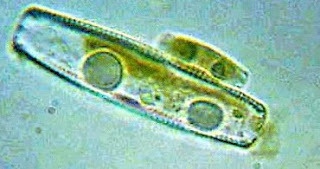 Of course, this is not any ordinary algae, diatoms, almost 200,000 species, can give us the potential for oil and gasoline. Perhaps through genetic manipulation, these single cell algae beasts can be kept "alive" or "reused" for continuous production. But where does one find our special little, green friends? 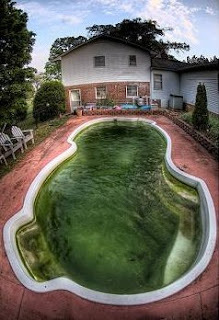 The rich diatoms are in the scum of aquariums or even your pool. The secret ingredient is basic moisture and sunlight. Let's get cookin' and make some oil!